"You can help Jinteki shape the future. Your future." Here is a list of resources with cost 3 or greater. I don't do reviews of cards that I haven't played with, but here are some initial comments: With Daily Casts and Earthrise Hotel being popular, this card is a nice boost. Key resources, like Professional Contacts or Xanadu, need to hit the table when they're drawn, making decks looking to capitalize on Career fair need to play resources that don't need to hit the table right away. Rachel Beckman could fit in nicely there. At the date of writing this, Criminals are the least suited to a strategy reliant on high-cost resources: there are only 3 cards on the list, and all of those cost 3. 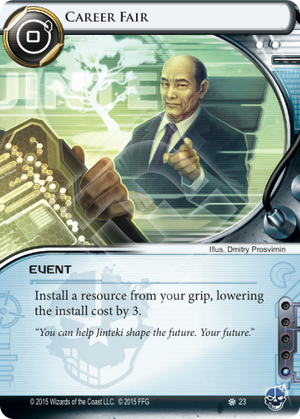 This card promises a wider variety of resources in Criminal hands, hopefully in this cycle. Strangely, I expected this type of card to include hardware after seeing The Supplier. I doubt I'll come back to post a long-form review of this card; the economics of Modded are well explored. I've tested this card in a bunch of decks and it perform great. Can be a perfect match with Comet to play resources in a cheap way or simply lowering the cost of some card. For 1 influence can be played everywhere, I like it a lot.